Scaremongering by adults has created a false impression of a "toxic childhood", says England's Children's, Schools and Families Secretary. Ed Balls, issuing a counterblast to pessimistic views of childhood, says the "vast majority of children feel happy and safe". And he rejected the idea that previous generations had better childhoods. But the government's report shows that there has been an increase in reports of bullying and emotional problems. "Childhood is better than it's been ever. It's not toxic, most young people are happy, most young people are doing better at school than they were, most young people are accessing new technologies, making friends... the trends are positive," Mr Balls said. His comments followed the publication of Children and Young People Today, a snapshot showing how young people are now living in England - which will be used in the government's Children's Plan, expected next month. The headline conclusion of the report is that - contrary to fears about the risks and stresses of modern childhood - most children are healthy, emotionally secure and happy. But it raised concerns about 8 to 12-year-olds - the "tweenagers" - who needed more support in the transition between childhood and becoming a teenager. A report from Unicef earlier this year put the UK at the bottom of the league in terms of children's quality of life in industrialised countries. But Mr Balls rejected such a view - saying that although there were many examples of problems affecting the young, such as under-age drinking or mental health problems, the big picture being overlooked was that most children had secure and happy lives. Children had more opportunities in terms of travel, leisure and education than their predecessors, he said - but a relentless focus on bad news was creating an artificial sense of gloom. "If the only information that parents get is negative and worrying, they will become more concerned. We have a responsibility to redress the balance," he said. "The streets are safer than 20 years ago," he said - but exaggerated fears meant that fewer children played outside or walked to school. Mr Balls also highlighted the way that tackling a problem could create the impression that it was getting worse. "Bullying is a good example. We know that this is a big worry for young people. "If we did this survey 30 years ago, it wouldn't have been on the agenda. We knew it went on, but we didn't talk much about it. Today we're much less tolerant of bullying. "Does that makes us a stronger or a weaker society, because we're no longer sweeping it under the carpet?" He also highlighted under-age drinking as an area in which an overall improvement is set against a more polarised, acute problem among a minority. "The number of young people who are drinking alcohol underage has fallen in the last 10 years - but those who are drinking underage are drinking more than they were 10 years ago. "Rather than a rising trend in underage drinking, it's going down - but you could present this as a 'teenage alcohol epidemic'. It's not what the facts say, but you can present it in that way." The report examines the issues which could affect children's sense of well-being. 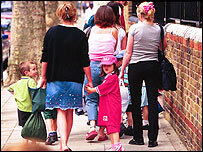 Using a survey of 110,000 pupils, it says that 93% of children "felt happy about life at the moment". But there were anxieties. Exams and problems with friends were the biggest worries. Obesity is a continuing concern - and many children felt unsafe on public transport.